As a YFU student in Japan, you'll discover a land of contrasts. East and West. Tradition and innovation. Industry and family. Shinkansen (bullet train) and tatami (straw mats). As a YFU student in Japan, you'll discover a land of contrasts. Konnichiwa! If you’re looking for a fascinating culture with a rich history, beautiful scenery, and welcoming families and friends, then Japan may be just the place for you! Come to the birthplace of manga, anime, origami, kimonos, and samurai, where you can learn firsthand about all these popular fixtures of Japanese culture – and some you don’t know about too! Japanese culture meshes Japan's history with its present-day influences: one night, you and your friends may enjoy singing karaoke, another evening you may attend a performance of traditional theatre like noh or kabuki. You might read haiku one day and a novel by Yukio Mishima, a modern author, the next. The Japanese enjoy newer sports like snowboarding and baseball, as well as traditional sports like sumo wrestling and kendo (fencing). One way of experiencing the Japanese way of life is through school, where you will take classes with Japanese students in various subjects including world history, mathematics, English, contemporary Japanese language, Japanese classics, chemistry, physics, geography, ethics, politics and economy, biology, music, fine arts, and physical education. Many extracurricular activities are also available through school, a popular one being martial arts. Food in Japan will certainly be an experience – and if you’re open to trying new things, you’ll probably love all the new foods! With sushi, rice bowls, and different types of noodles, you’ll be able to try all sorts of things, like chashu and moyashi! In Japan, you will find a truly unique culture of ancient history with a modern twist. 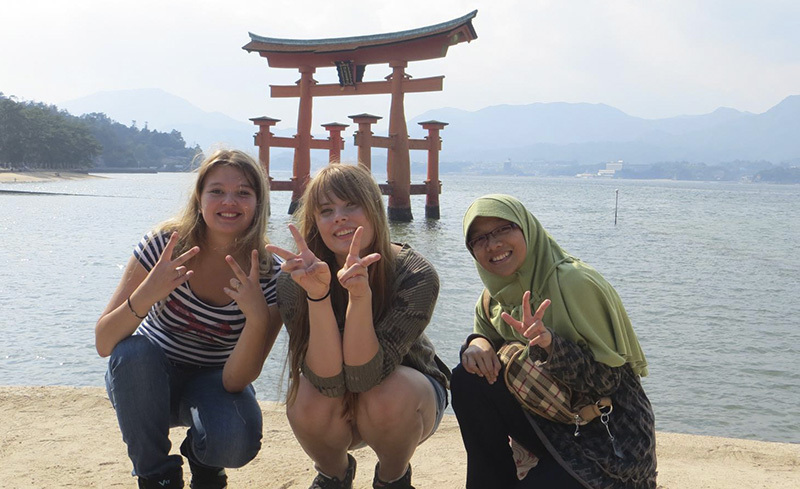 By going on a YFU program to Japan, your experience will open up endless opportunities for your future! 360 - Mazda Canada Inc.
146 - Mitsubishi Electric US, Inc. Learn more about scholarships details and application deadlines. Students are responsible for paying any school fees (including books, transportation, and optional school trips), as well as all fees related to obtaining visas. Program tuition does not include personal spending money. Due to cultural differences, local customs, and school regulations, vegetarians, vegans, students with strict dietary requirements, homeschooled students, and students who have been diagnosed with ADD/ADHD have not been successfully placed in the Japan program. Please note, Japanese schools typically will not allow students to bring any sort of medication into the school. Please check the Japanese Embassy website for more information regarding this topic. Smoking in Japan is illegal for those under the age of 20. Violating this, or any Japan law, may be terms for immediate dismissal from the program. Students to Japan may be placed with a host family anywhere in the country, including the Okinawa Islands, in either a rural or suburban setting. Students are normally not placed in large urban centers, but often are placed in small towns, where they have an opportunity to become an integral part of their host communities! Students will typically be placed in the first or second year at a Japanese high school. Most schools are quite large, averaging 500 to 1,000 students. You will likely study subjects like Japanese classics or contemporary Japanese language and you may also attend elective classes that include subjects such as art and calligraphy. You can choose to attend club activities after school such as karate or judo. Japanese schools are generally conservative and therefore the dress code in Japan may be stricter than you are used to. In Japanese schools, students do not have unnaturally dyed hair or eccentric hair styles. Piercings, earrings, necklaces and rings are not allowed in schools. Students cannot wear makeup, perfume, or have visible tattoos. Female students cannot wear skirts above the knees or high heels. Male students should not have a beard or long hair. Schools in Japan almost always require uniforms. The cost of a school uniform is included in the program tuition. All students applying for the semester or year program must be available for a mandatory 3-day National Pre-Departure Orientation, which usually takes place in mid-July or early December. This orientation is a required part of the program aimed at preparing students for their experience overseas. All students will participate in a one-day local pre-departure orientation in May/June or during the winter for spring departures. All orientation costs are included in program tuition. 2019 January term: April 2, 2001 to April 1, 2003. All other programs: April 2, 2002 and April 1, 2004. Students applying for the summer program who do not meet this age requirement will be considered for admission on a case-by-case basis. Students applying for a semester or year program who will graduate from high school before the start of their program will not be considered for admission. Japanese. Previous language study is not required. A Japanese correspondence course is included in program tuition for long-term program participants. Students to Japan may be placed with a host family anywhere in the country, including the Okinawa Islands, in either a rural or suburban setting. Students are usually not placed in large urban centers. Explore Japan during the winter months with this unique YFU program option. Students participating in the January term program will live with a volunteer host family, attend a local high school, and get to know Japanese culture and customs through daily life in their community. Japan comes to life when you arrive for your six-week stay with your host family and attend a local Japanese high school. Attending traditional tea ceremonies, practicing martial arts, and visiting local summer festivals are just some of the activities that YFU students to Japan may experience during their exchange. 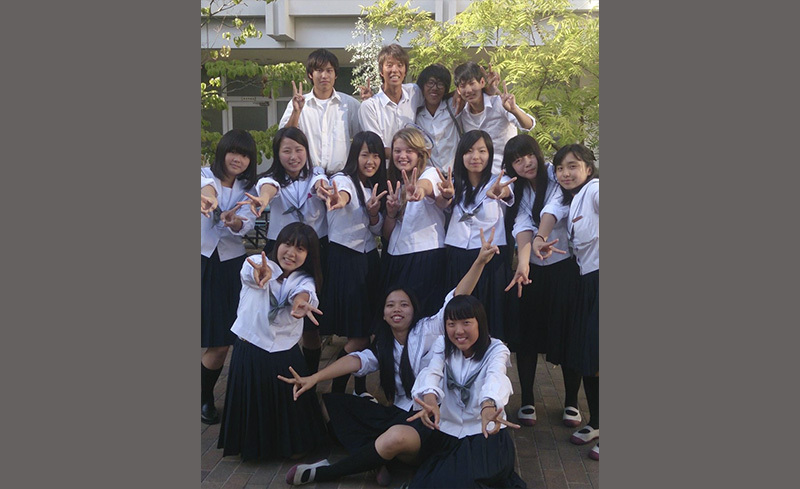 School is in session during our summer program in Japan, so students will attend classes at their host high schools. Students have the opportunity to attend and audit classes but are not officially enrolled in the school during their stay in Japan, so students will not receive report cards or evaluations of their performance. All students applying for a summer program must be available for a mandatory 3-day Japan Pre-Departure Orientation, which takes place immediately prior to the departure date. This orientation is a required part of the program aimed at preparing students for experience overseas. All students will participate in a one-day local pre-departure orientation in May or June, and an arrival orientation in Tokyo. All orientation costs are included in program tuition. 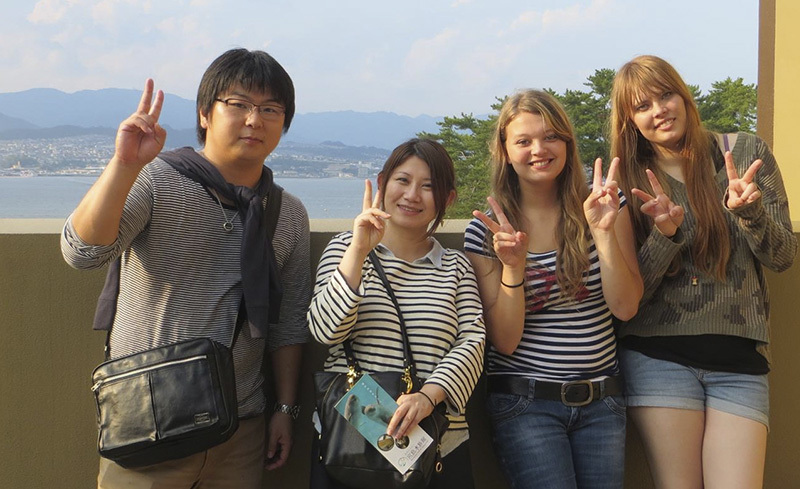 Over 150 YFU students studied in Japan last summer on full and partial scholarships! To find out more about scholarship opportunities, please visit our scholarships page.